The Boat School Start Yachting course is the very first step in the RYA training scheme for sailing yachts and is aimed at beginners looking for an introduction to the basics of sailing. Here’s a summary of what you need to know. The boats we use for training are all commercially coded and inspected by the RYA. Yachtmaster candidates can rent the vessel we’ll use for the course and exam to get some extra practice before the start of the course. Click on the tabs for more detailed information. The course lasts two full days. Each day starts at 09.00 and finishes at 17.00 with a break for lunch between 13.00 and 14.00. RYA Start Yachting is taught in small groups with a maximum of five students. The Boat School’s two-day RYA Start Yachting course provides a short beginners’ introduction to sail cruising. This course requires no previous sailing experience. Please note that this is not a skipper’s licence; you won’t be able to charter a yacht or skipper your own yacht without a qualified person on board. The Start Yachting course is a great way to get a feel for sailing. It’s also a great way to learn the basics if you’re going to be crewing on a yacht; however, if this is your objective (and assuming you have the time), we recommend that you take the full 5-day Competent Crew course. Holders of the Start Yachting certificate can go on to complete the Competent Crew course in a reduced time of three days or two weekends. You can choose to complete the course either as part of an open group or you can rent a boat for the day and complete the course with family and friends. With an open group booking, you book a place on a course and we’ll admit up to a maximum of five students onto that same course. This is the most economical option; however, it’s also the least flexible option if your availability is limited. The price of a seat on an open course includes fuel and mooring fees away from our base. We publish regular course dates all year round and you can book the course directly online. For the rest of the year, we schedule courses in accordance with the availability of students interested in the course. With this option, you charter a sailing yacht and we provide the instructor and teaching materials. This option gives you the maximum flexibility in terms of dates and the kind of boat we’ll use in training (subject to availability). With the rental and course pack, you’ll also have more say in the itinerary. As with any charter, you’re responsible for paying the fuel for the boat as well as mooring fees away from our home port. On this kind of course, we’re allowed to take “passengers”. This means that you can charter a yacht for 5 people and not all of this will need to be actively involved in the running of the boat. If you already own a yacht, or if you have a friend who owns a sailboat, we’re more than happy to run an RYA Start Yachting course on your own boat. This option is significantly cheaper than open groups and charters; however, you do need to make sure that your boat is up to the standard required by the RYA for training. Where will I be sailing? On the first day, we’ll spend most of our time afloat in and around the harbour of Denia. 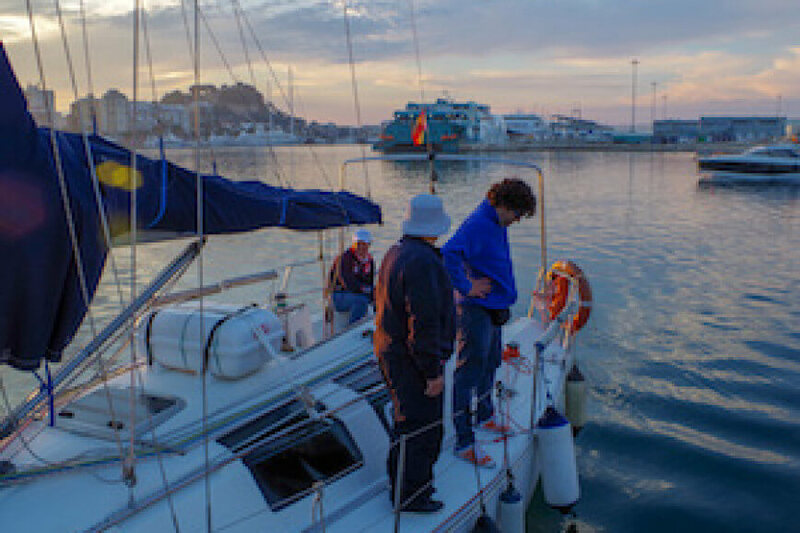 On the second day of the course, we’ll go further afield and sail down to Javea. There is no minimum age to participate in the course; however, we only run this course for under 16’s if the parent or guardian is taking the course at the same time. You won’t need a medical certificate but you should be in reasonable physical shape. Complete the form and we'll get back to you. Ready to book? Got any questions? If you’re interested in a course with The Boat School, please complete the form below and we’ll get back to you. We’ll talk you through the options in English or Spanish. Recognized by the Royal Yachting Association to conduct Powerboat Training, Sail Cruising courses in the Yachtmaster (sail) scheme and Shorebased (theory) courses. Recognized by the Spanish Directorate General for Merchant Shipping, the Comunidad Valenciana and the Region of Murcia to conduct sail, motor, powerboat and VHF training.